The stock clutch springs in a KLX or DRZ 110 are pretty weak. They make the clutch slip smoothly as you shift between gears and will slip excessively with an adult rider or with a big bore motor kit installed. And rightfully so! Remember, this bike was made for a kid. And not just any kid, a rank beginner at that! 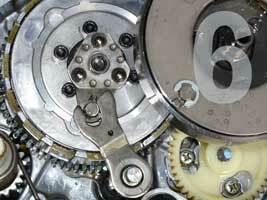 Fortunately for you there are a variety of companies out there that produce stiffer aftermarket clutch springs. Installation is a pretty simple chore and after reading this article you will be able to do it in about an hour. In no time your pitbike will have gratuitous snap when changing gears, even without a manual clutch. The first thing you need to do is drain the oil. Get out your trusty oil pan and slip it under the bike. 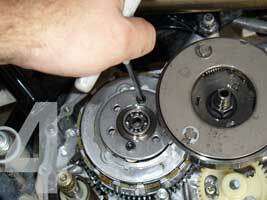 Use the 14 millimeter socket and ratchet to remove the oil plug. Next remove the fill cap and let her drip for a bit. This will go a little quicker if the bike is warmed up, especially if it's cold outside. Be careful after heating the bike though. The exhaust pipe gets smoking hot so if you decide to let it run to warm up the oil make sure you let it cool down for about 10 minutes before going to work. Don't come crying to me if you burn yourself because you didn't give the pipe time to cool down before you wrapped your paw around it. Now remove the skid plate (using the 13 mil and 8 mil and ratchet), footpeg mount (13 mil and ratchet), kickstarter (10 mil and ratchet) and brake pedal (10 mil and ratchet). They are all in the way and must be removed before we can go any further. Now we can get to work. 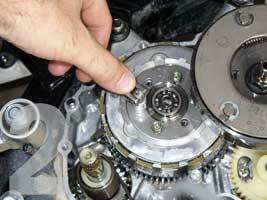 Use the impact wrench to loosen and remove the clutch case cover. That's the one one the right side of the bike, the side with the pipe. I found this easier to do with the bike leaned over. Put the left handlebar on your bike stand (or something similar that's sturdy). With the clutch cover removed, peel away the old gasket and clean up the mating surfaces of the case and cover removing any old gasket material. You should be looking at something like figure 1. 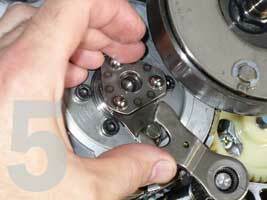 Remove the triangle shapped bearings and shifting fork from the clutch assembly. I didn't get a good picture of this while taking it apart, so refer to figure 5. Loosen the 4 bolts holding the pressure plate down and the clutch assembly together. These run through the springs. There are 6 holes but only 4 bolts. This is because they only installed 4 springs from the factory. Your new kit should have come with new bolts for all 6. See figure 2. In figure 3 you can see the 4 of 6 spring set up with the pressure plate removed. You can replace put all 6 stiff springs in if you want, but I decided to put 3 stiff springs in with 3 stock ones. This configuration worked perfectly for me with my stock engine, and continues to work fine now that I've installed a 143cc big bore kit. I'm still using the centrifugal auto clutch so I'll update the article if I get a manual clutch and there's something new to report. Put that sucker back together. It should go back together the way it came apart. Put the pressure plate back on, use the new bolts to tighten everything down, re-install the triangle bearing and shift fork. Make sure notches on the shift fork line up with the ones on the clutch assembly. See figure 5. Figure 6 shows the whole clutch back together in one piece...for your reference. 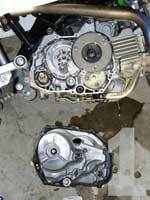 Slap a new gasket on the clutch cover and put it back in place. 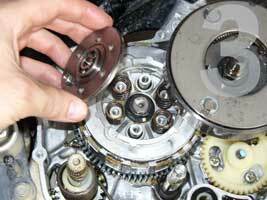 Install and tighten down the clutch cover screws. I've been told that this would be a good time to replace the philips head screws with allens...but I was too antsy to waste the time running to the hardware store. With the clutch cover installed you can now put the peg mount, skid plate, brake pedal and kickstarter back on. With those parts in place, the only thing left to do is fill it up with oil and go out for a spin.